Newcomer and Indigenous youth come together to learn about the Buffalo. The (Regina Open Door Society - RODS) youth team is pleased to announce that on Wednesday April 4th & Thursday April 5th, our newcomer youth along with Indigenous youth from North Central Family Centre participated in the Youth Bridges program by attending a workshop on Buffalo and learning about traditional Indigenous teachings. 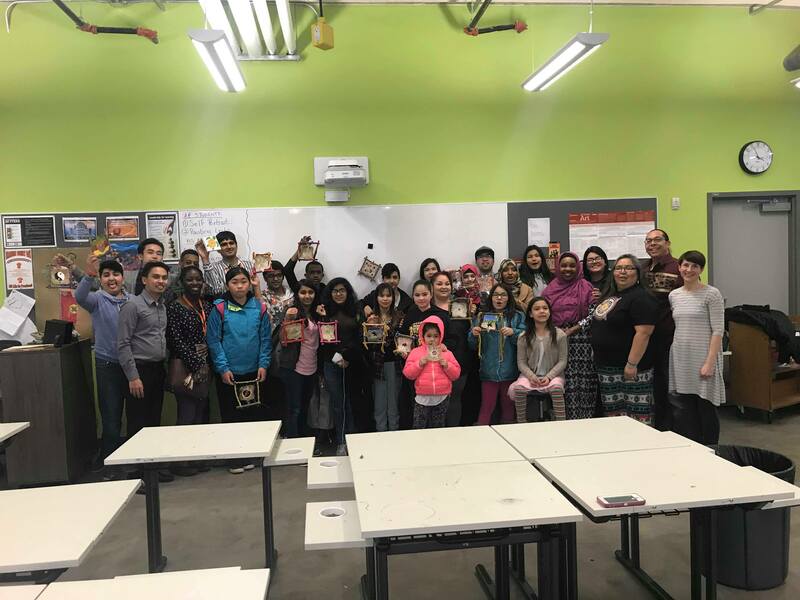 The Youth team would like to thank Common Weal Community Arts for helping to facilitate the program, we would also like to thank Joely BigEagle-Kaquahtooway for facilitating the event and for discussing on the importance of Buffalo and connecting the history through Buffalo parfleche. The Youth team would also like to acknowledge the Multicultural Council of Saskatchewan and North Central Family Centre for their time and dedication on this project. The two day workshop was held at Mâmawêyatitan Centre, where the Newcomer and Indigenous youth built cross-cultural friendships, learned the history of Indigenous people throughout Canada, and learned how to create Buffalo parfleche. The youth were also able to spend time reflecting on, and discussing the workshop. The second half of the program concluded with a potluck, buffalo was provided by Joely BigEagle-Kaquahtooway and the Indigenous and Newcomer youth shared their traditional food! Definition: A parfleche is a Native American rawhide container. Enveloped-shaped perfleches have historically been used to contain items such as dried meats and pemmican. The word was originally used by French fur traders, and derives from the French language parer meaning "to parry" or "to defend", and flèche meaning "arrow", so called because the hide was tough enough to be used as a shield. Traditionally women are the main creators of parfleches, first painting stretched out raw hides, then shaping them into their final form. In contemporary culture, both women and men make them.